"The Iraqi Central Criminal Court has sentenced convict Ahmed Ali Ahmed to death because of his involvement in the murder of Archbishop Paulos Faraj Rahho in Mosul," government spokesman Ali al-Dabbagh said. The cleric's body was found two weeks after he was kidnapped as he returned home after mass on February 29. The military had said they arrested a man directly involved in the murder two days after the body was found on March 13. The US embassy in Baghdad welcomed the verdict. It was not known when the sentence would be carried out. 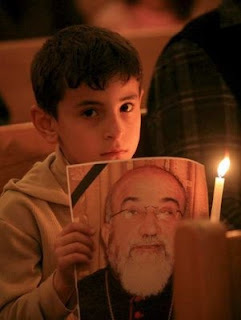 The US embassy and the American military had blamed Al-Qaeda for Rahho's death which the church had said was a direct consequence of the kidnapping. Dabbagh said Rahho had been one of Iraq's most prominent clerics and that he had advocated peace and tolerance in the war-torn country. Rahho was the latest in a long line of Chaldean clerics to be abducted since the US-led invasion of 2003. His death fuelled fear among Iraqi Christians who have come under frequent attack in recent months, with clerics kidnapped and churches bombed. In April gunmen shot dead an Assyrian Orthodox priest, Youssef Adel, near his house in central Baghdad's Karrada neighbourhood. Iraq's Christians, with the Chaldeans by far the largest community, were said to number as many as 800,000 before the invasion. Today their numbers are believed to have been halved. Despite the church's well-noted teaching on capital punishment -- and the Pope's remark in his January "State of the World" speech that he "rejoiced" at the UN's adoption of a global moratorium on executions, voicing "hope" that the move would "lead to public debate on the sacred character of human life" -- no statement on the sentencing has yet surfaced from the Holy See. SVILUPPO: The Italian agency Korazym reports that the sentence was condemned by the Chaldean church. "Christian principles affirm that it is not permissible to condemn anyone to death," said Auxiliary Bishop Shlemon Warduni of Baghdad, "but to invite them to peace, reconciliation and justice. "The interests of the Iraqi church are peace, security and the reconciliation of the country," Warduni added, "all the things for which Archbishop Rahho gave his life and toward which we continue to work."